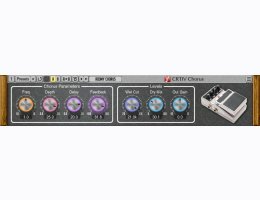 CRTIV Chorus is a stereo chorus effect AAX, AU and VST plug-in for professional music production applications. Chorus is able to produce stereo-widening and weird modulation effects. The Chorus plug-in uses 4 operators for each channel, thus creating a quite dense stereo chorus sound. This audio plug-in can be loaded into any audio host application that conforms to the AudioUnit or VST plug-in specification. Plug-ins with AAX version available can be loaded in ProTools 12+. RTAS compatibility is available by using the FXpansion VST-RTAS adapter. A separate binary distribution file is available for each target computer platform for each audio plug-in specification. Cubase, Logic Pro, Ableton Live, ProTools, Reaper, Cakewalk Sonar, Presonus Studio One, Nuendo, WaveLab, GarageBand, FL Studio, Sony Vegas, SoundForge, Adobe Audition, Samplitude, Digital Performer, Mixcraft, Bitwig Studio, Edius, others. Processing output is muted for a moment every 45 seconds. The Demo version is authorized with a product key, which is a text string - no challenge/response nor dongle required.